The Forum Boarium is the oldest Ancient Roman forum in the Italian capital, with its origins lying in the era of the Republic. It was the central cattle market for Rome, and one of the city’s most important centers of commerce. Originally the area consisted mostly of swampy ground, but the land was reclaimed by the Etruscan rulers of pre-Republican times. The forum lies between the Aventine, Capitoline, and Palatine Hills, close to the Tiber River. King Servius Tullius was the first ruler to order substantial building works in the area, having a port constructed in the sixth century BC. This, together with the increasingly important trade routes in the vicinity, gave the area of the forum a very busy atmosphere, with huge amounts of commercial activity being carried on. Two of the temples that were built in the forum during the Republican era still survive in a remarkably well-preserved state. The Temple of Portunu, is dedicated to the god who watched over harbors and sailors. The temple dates from the first century BC, although the god had been honored there from almost 500 years prior. The smaller temple, dedicated to Hercules, is slightly older, having been built some time during the second century BC. 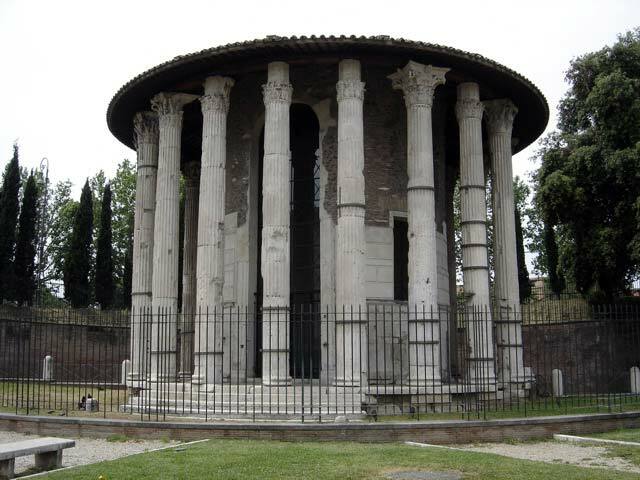 The Temple of Portunus is rectangular, with free-standing columns at the front. Other columns are incorporated into the walls elsewhere in the Ionian style. The temple stands close to the remains of the Pons Aemilius, a bridge erected in the second century BC. The temple’s small chamber and portico, which stand on a podium, are reached by a short flight of steps. Unlike many temples built at the height of Roman power, this one is built, not of marble, but of travertine that is covered with stucco. The Temple of Hercules is round in shape and was likely originally one of a pair of temples dedicated to Hercules. A few historians suggest that there may even have been three. The architect of the temple was a Greek named Hermodorus of Salamis. He was also responsible for the Temple of Jupiter Stator near the Circus Flaminius. The Temple of Hercules was built as the result of a commission from a wealthy merchant, Marcus Octavius Herrenus. As the Roman Empire fell into decline, the forum also lost much of its original grandeur. The statue of Hercules, which was sculpted by Scopas the Younger and dated back to Temple of Hercules’, was lost. Meanwhile, increasing numbers of shops sprang up in the vicinity. The temple itself, however, remained in relatively good condition. After the conversion of the empire to Christianity there was no need for pagan temples. Thus, both temples were deconsecrated. They found new roles as churches in medieval times, and the Temple of Hercules was restored in the late 15th century. This ensured the continuing upkeep of the structures, allowing them to avoid falling into ruin as many other Roman buildings has done.